This animation is supposed to show a change of emotion using only body language and poses, instead of relying on blatant facial expression. I'll let you watch before I explain and taint your perception of whats going on the characters mind. In other news I'm still continuing my half life 2 play through, I have just started Episode II and for some reason it barely runs, visually it looks about the same as episode one, and I used to play on nigh on mazimum settings, now I have to play it looking like sh*t just so it'll run smoothly. I don't get it. When I read Extra Lives by Tom Bissell, there was a quote on the back of the book from a guy called Michael Abbot. Michael Abbot teaches a course at a university that studies readings of importance, be it cultural aesthetic of otherwise. The term readings is very broad and students on the course will read novels, plays, watch films and, for the first time, play a game. When pitching this addition to the course the game chosen was Portal. This game was chosen because of its antagonist; whose role in guiding, fooling, and delighting the player has great relevance to other texts on the course, and is also a leading example of the sophistication that is possible, but painfully absent, in contemporary games. Everyone go play it. Michael Abbot runs a blog and podcast called The Brainy Gamer which functions to provide analysis and critique on gaming and the industry as a whole, its well worth following. Another aspect of the Brainy Gamer blog in the Vintage Games Club, a club that anyone can join that serves to bring people together for communal play throughs of "vintage" games that many gamers from this generation may have missed or never even heard of, its a great way to discover some of the best games from yesteryear and then have a whole bunch of people there to discover it with you, and discuss each others experiences. Currently they're playing Planescape: Torment, and for the first time I've joined them. Its nice playing an old game, where conventions like cut scenes don't disrupt the game play, and heavy handed tutorials don't treat the player like a cretin. 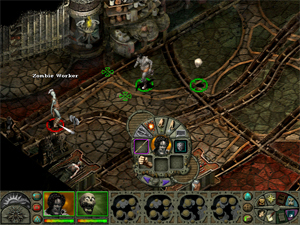 Planescape is a game where the themes are tightly woven into the gameplay, its about discovery and death/life, so when you "respawn" there's a plausible context for that occurance that reinforces the game mechanice of dying and resurrecting, you literally start in a mortuary every time you die. Due to the protagonist's amnesia, you know nothing about yourself, so the player is free to explore, uncover memories, have conversations with NPCs that reflect who you want the character to be, and support the core gameplay of exploration. The conversations are all text based excpet for a few key lines from the supporting characters, but because of this text, the developer was able to create a world where nearly everyone has something to say and a branching conversation for you to take part in, this makes the Planes feel like a rich and alive place, though it does make for a lot of reading. God forbid we should have to read text in a modern console game. Posted in "2", "Half Life", "animation", "brainy gamer", "emtion change", "extra lives", "maya", "michael abbot", "planescape: torment", "portal", "tom bissell", "vintage games club"